Sometimes it pays to know your limits. Horse shows are just that: putting on a show. And grooming is an integral part of every production. I’ve always embraced the entire process of prepping a horse for competition. Can you blame me? Who among us doesn’t enjoy playing the horse-show version of beauty school makeover? Grooming provides a sense of self-satisfaction and personal accomplishment. Your efforts magically transform a perfectly pleasant yet probably plain bay, gray or chestnut into an equine celebrity. You can literally see the effects of your handiwork as it happens. Unfortunately, like many roles associated with caring for a horse, serving as a horse show groom is exhausting. This is especially true if you choose to do it at the very same show where you’re competing. I learned this the hard way. I was so excited to compete in the annual hunter/jumper championship show that I allowed my enthusiasm to cloud my judgement. Besides grooming, braiding and showing my own two horses, I arranged to also braid all the other horses in my trainer’s barn. I knew that would add up to more than a dozen hunters that required manes and tails braided at various times throughout the week, but at the time it seemed like a doable task. Multi-day horse shows historically turned me into an insomniac, no doubt due to an overload of nervous adrenaline, so I’d be awake through most of the night anyway. The money earned by braiding into the wee hours would cover the cost of the entire show. That certainly beat lying awake all night and staring at the ceiling of my motel room until the alarm clock rang. What could go wrong? The show began on a Monday morning with all the hoopla befitting such a prestigious event. 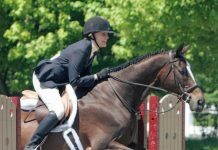 I was filled with so much competitive zeal that I bounced from horse to horse and from barn aisle to arena, cheerfully juggling my distinctly different roles of amateur rider and professional braider. For the first few evenings, I had enough energy to maintain a civilized schedule. 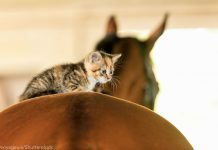 Once the day’s classes ended, I’d drive back to the motel room, shower and change into jeans and a sweatshirt, and then join my trainer and the rest of the barn’s riders for a proper sit-down dinner at a swanky restaurant. Only then would I cruise back to the showgrounds, park just outside the shed row, and plait at least 30 tiny braids into each hunter’s mane. Weaving a tight French braid into each silky tail would almost be an afterthought, my fingers working on autopilot while I mused over the otherworldly beauty of the barns bathed in moonlight. By Thursday I was a zombie. 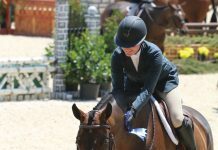 Riding in most of my classes was akin to an out-of-body experience: I felt my hands on the reins, my feet in the stirrups, but I had the sensation that I was watching my doppelgänger jump the courses. If the martingale strap happened to rub against a braid on my mare’s neck, I’d cringe, because that meant one more braid that I’d have to replace that night. I was so desperate for sleep that I commandeered one of my trainer’s canvas-backed folding chairs and set it in the stall that served as our feed room. I’d doze in it for a couple of hours, still clad in my show clothes and boots, while everyone else waltzed off to dine. My diet had become whatever I could glean from the concession stand between my classes—primarily lukewarm soda, Doritos and stale unfrosted donuts (they were the only ones that were ever left in the box). 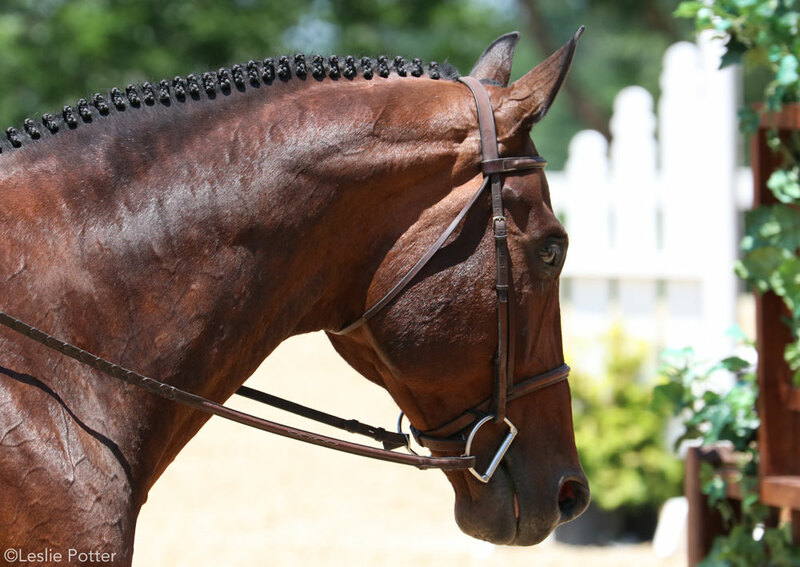 Be assured, however, that all the horses I was assigned to braid continued to look elegant. I made sure of that, even if it meant that I skipped enough evening showers that I began to notice I smelled faintly of dust, horse sweat and the hair styling gel I sponged on damp manes. On Saturday night, the final session of my braid-a-thon, I found myself staring, bleary eyed, at the list of horses that needed braiding that night. There were seven. With the few active brain cells that remained, I did the math. Seven horses with a minimum of 20 braids each totaled 140 braids. I sat down on the nearest available tack trunk and cried. And then I dragged myself over to the tack room, plugged in the radio, haltered the first sleepy horse and led him out to the cross-ties. I went to work, and with the first knot I started the process of counting backwards from 140. Contrary to what you might expect, I continued to braid horses throughout my show career. Yet I was never that naïve again. I learned to balance the time required to braid each horse with the physical demands of competing. Being the Horse Hair Stylist to the Stars definitely has its financial rewards, but restful sleep and a decent diet are priceless. Previous articleAsk the Vet: How’s the Hay?